I like to make living rooms which use 45-degree angle positioned chairs or sectional sofas that turn a corner. However, these realistically positioned chairs are no use for your Sims to watch TV from which has always annoyed me. So this is a mod that allows the watching of TV from those sorts of chairs. Since a picture is worth a thousand words, have a look at the pictures for more information. This mod also allows the watching of TV from much further back making large cinema rooms usable. From my testing, a Sim can watch TV sitting in a chair that is 10 squares back from the TV, and probably much further too. A variety of arrangements of seating can be used now to watch TV. The picture shows a selection that I tested out, but you can no doubt find many more. Any issues with particular arrangements, let me know and provide a picture of your layout (indicating where the Front of the Lot is). 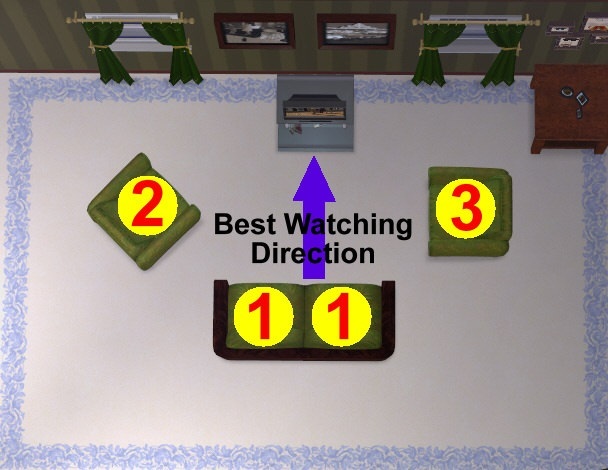 Sims will endeavour to choose the nearest chair that has a clear view of the TV. When there are a selection of chairs at the same distance to the TV they will try to pick the best viewing position first. This mod does not work with the Base Game. You require an EP (any EP) to use it. It would seem the function that determines whether you have a clear view of the TV only works some times in the Base Game which may explain why Maxis didn't do this to start with. I have also seen it not be perfect when determining whether chairs that are not facing the TV (for example a dining chair around a dining table in the same room as the TV) with Uni as well, but the same layout works perfectly with later EPs. It seems that the function by which you determine whether you have a clear view of something - Ray Trace (0x0078wiki) - has been gradually improved by Maxis over the later EPs. Even at Uni this mod should give you benefits because you can at least use chairs that are not looking straight on at the TV, i.e. those around the sides or at angles. You may just have to watch out a little in open plan houses in early EPs for TV watching with a lot of neck craning. While developing this I had to deal with the fact that Sims sometimes both go for the same chair, and so then the second one to arrive would go back to standing - that should now be fixed. There may be other cases that I haven't seen where Sims will revert to the old behaviour of standing to watch TV (I have kept that behaviour as a catch all) - if you see any, let me know. If you do see this, you can cancel the action of watching the TV and re-do it, to redrive looking for a decent chair to sit in. Of course, if there aren't any chairs to sit on, then standing to watch TV is by design. Have been asked why a computer desk chair, which was close to the TV, was chosen for TV watching instead of a sofa which was further away but face on. As per the current mod, this is correct - however, it is a quirk that is not perfect, so I am going to enhance this mod to make chairs that are at a desk/table less preferential unless all other chairs in the room are taken. Watch this space. I don't know of any mods this clashes with. There is always the possibility of course, so the pertinent information for the owner of the other object is here. 3800 people have said thanks to MogHughson for this download. Apartments and Shopping, on the same Lot!